Everyone has a family tree. Painter Njideka Akunyili Crosby’s exhibition, Predecessors, outlines her family tree poignantly. She gives us the women in her family in portraits and with important personal photographs that are photo-transferred and are featured in still life tableaux. She further imbeds in her paintings photo-transfers of important Nigerian political and popular figures she finds in Nigerian magazines and newspapers. These she features as small patterns on walls and tablecloths, her enlarged family tree. 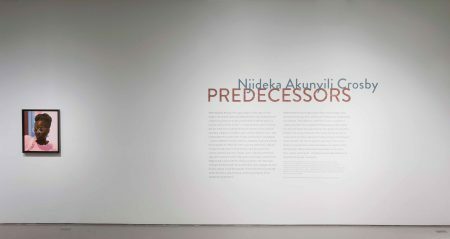 These personal and political figural elements provide a rich trajectory for story paintings that combine portraits and self-portraits, still life objects from home in Nigeria, photographs, and memory places that are juxtaposed with “places” here in the United States where she migrated at age 16. Now she is famous and her paintings command high prices. Ian Berry & Steven Matijcio of the CAC and the Frances Young Tang Museum at Skidmore College, Saratoga Springs, New York, curated this exhibit at the Contemporary Arts Center, Cincinnati. It is on view through Sunday, October 1, 2017. I immediately began constructing in my mind that she has ancestors in the art world who are on her family tree. Numerous artists come to mind. Given Crosby’s extensive use of photo-collage transfers, Romaire Bearden immediately comes to mind. Bearden is in a class by himself for his early use of magazine and prepared paper collages that featured local and popular African-American figures featured in magazines. Bearden was part of the Harlem Renaissance in the early part of the twentieth century and expressed Harlem’s vibrant life in his vernacular paintings. His use of collage elements is brilliant and his cut forms are superbly integrated with the painted areas of his watercolors, prints and paintings on canvas. Since a lot of Bearden’s work is seen in reproduction, we forget how large some of his collage paintings are. 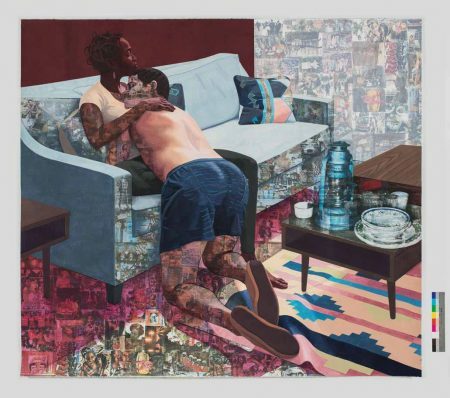 So, too, we are surprised by Njideka Akunyili Crosby’s large collage-like paintings on paper. Njideka Akunyili Crosby uses a popular technique of transferring a magazine photo directly onto new paper by placing the cutout image into place on the new paper and rubbing the magazine cutout with acetone. The colored image sinks into the new paper and the original magazine paper pulp, now wet with acetone, is rubbed away, leaving the image imbedded in the new paper. The image is not overly bright, one of its charms. It has a rubbed, slightly faded look. Often we think of some of the pioneers of collage, the Cubist artists Braque, Picasso, Schwitters and Gris, who all made collage famous in the contemporary art of their time. Yet collage is as old as papermaking itself. What was fresh is that artists in the 19th and into the 20th centuries began adding commercial printed collage materials into their fine arts works to give them a contemporary edge. Photoshop is our current continuation of collage mentality, though the use of cutout magazine or photo elements has not been exhausted and seems appropriately retro here. Crosby received her MFA from Yale University School of Art in 2011. Fellow Yale painting alumnus is Kehinde Wiley, whose father is Nigerian and there may be some positive and healthy residue in the air at Yale, supporting these two different artists to explore their African heritage fully. Wiley traveled to Nigeria to more fully explore his roots. Wiley could be an artistic older cousin since he too explores his racial identity and embraces the rich textile heritage of Nigeria. 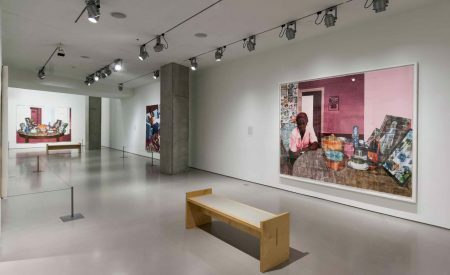 Njideka Akunyili Crosby uses the photo transfers from Nigerian magazines and newspapers almost as if they are the decorative textiles of her homeland. She uses the photo-transfers full on in her paintings to fill in tablecloths and for example, create almost tattoo-like patterns on the figure of her American husband in the painting Ike Ya. Yet powerfully, these photo-transfer images, though very pattern-like, carry powerful political messages to anyone who can decode them, much like a lot of 60’s political art had photo-transfers of the Viet Nam war, the space program, grainy newspaper images of JFK and so on. No one used this to greater effect than Robert Rauschenberg from the 1960’s onward. So Crosby is part of a very large family of artists who have found ways to use mechanical elements, whether actual magazine cutouts or photo-transfer rubbings, to imbue their art work with greater meaning. People conversant with Nigerian pop culture and politics can view these paintings more richly. A Western audience may see these images as cool dudes or African dictators. The meaning of such an aggregate of photo-elements is fluid. What has Akunyili Crosby contributed to the conversation about contemporary art? To her admirers and collectors, she has taken a stand to value the personal and the personally meaningful. She’s a kind of anti-Wayde Guyton. Guyton’s artwork calls in the manufactured and the limits (exhaustion maybe?) of the mechanical, such as a mechanical feed of inkjet printing on a canvas. Crosby calls in a beautiful charcoal line that accentuates the calf muscle of her husband as he reaches across the couch to embrace her in the painting Ike Ya. Her paintings are not emanating the bold and individualized humanity of Lucien Freud, whose studio was his world and wherein he painted with hunger the people he knew and loved who were his studio models – from family to friends to hired models. Crosby likewise shows us that her family and friends are her world and the technical reverence with which she builds her still lifes or interiors with family demonstrate this. Technically, her paintings use drawing as their scaffolding. She builds compositions using aspects of cubist space, such as ignoring one and two point perspective in favor of spaces imagined from several viewpoints. She uses this cubist freedom to carefully create interiors as she remembers them from her homeland. There are crisp doorways in all her paintings in this exhibition. These create psychological airspace, of course, so that figures and memories have breathing room. She paints with precision, primarily using acrylics, which can be applied quite flatly. Their quick-drying nature allows for creating architectural elements more readily than with oils. Her heavy use of photo-transfer creates a consistent grisaille, which doesn’t seem to have been discussed. Photos, especially black and white photos, allegedly signal authenticity, truth and accuracy, owing to their indexical nature. (A footprint is an index since the foot made the foot print. A photo exists because light washed over the forms that are in view, as it were, and becomes fixed/entrapped in the photographic paper.) This underlying grisaille element is significant in the look and feel of her paintings. As curator Steven Matijcio stated in discussion, “Painting could not completely encapsulate the story she needed to tell.” Crosby selects her photographic references with great deliberateness and in every painting we witness her clarity and individuality. Finally, Crosby uses charcoal and colored pencil to amplify textural and linear effects. Her rooms are still. The movement anticipated or implied in a Matisse or Bonnard interior is absent. The Twain Shall Meet may be the linchpin of her current theme. In this large work on paper we see a tabletop, cluttered yet clean. It utilizes photo-rubbings of her grandmother’s plates, bowls, very personal photos of her grandmother and a blue kerosene lamp. While Crosby grew up in an upscale household in Nigeria, she summered often with her grandmother in a rural village. These rich memories drive this body of art works. And this particular painting celebrates her then-and-now and present-and-absent thesis. She was in Nigeria then and is on the West Coast of the United States now. She is present with an American husband, new cultural trappings and the Eurocentric painting norms Yale sanctions. 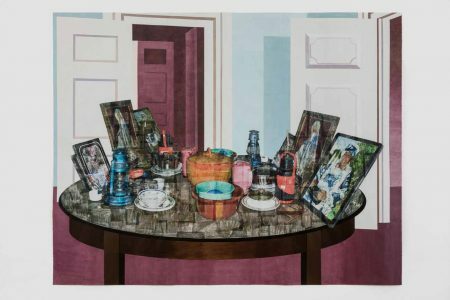 The absence may be seen in the voids of grandma’s dishes appearing repeatedly in her paintings in this exhibit in Cincinnati; there is no food in these dishes, the table is clean. Memories and the smells of the home and village become faint. Crosby’s recent accomplishments include: Njideka Akunyili Crosby: Portals, Victoria Miro, London, Hammer Projects: Njideka Akunyili Crosby, Hammer Museum, Los Angeles, CA, NO MAN’S LAND: Women Artists from the Rubell Family Collection, National Museum of Women in the Arts, Washington, D.C., UNREALISM, presented by Larry Gagosian and Jeffrey Deitch, The Moore Building, Miami, FL, Future Generation Art Prize @ Venice 2017, Collateral Event, Palazzo Papadopoli, Venice. and we always get together with Victor & Betty when my husband & I go to NYC. We live in Easton, Pa — not that far from NYC. I enjoyed seeing your watercolors. It looks to me like you have had a very active career. Good for you! Again, thank you for a very successful review.